I wanted to make dinner without having to go to the store tonight, so I decided to make simple fajitas and Mexican rice. Saute onion in 1 tablespoon of butter over medium heat until translucent. Add remaining butter and as soon as melted add rice. 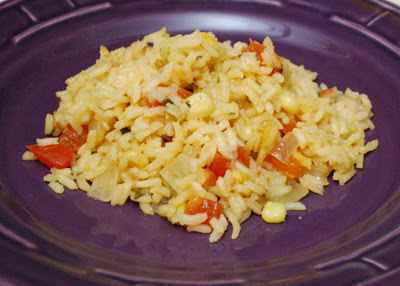 Saute rice like a pilaf until it starts to brown. Add spices and tomato and saute for another minute. Add broth, cover and simmer for 20 minutes. NOTE: Feel free to add corn, cilantro, and/or black beans with the tomato and spices. If the tomato is juicy, it may take longer than 20 minutes to evaporate the liquid. We added a few saffron threads to the liquids and I liked the difference it made. We also added some cilantro and a handful of white corn. Next time, I'd like to char the corn on the cob on the grill first. 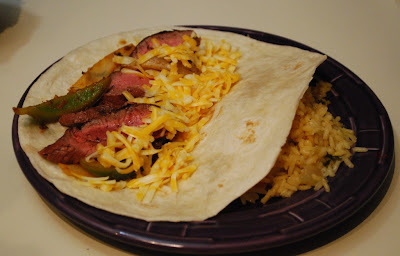 For the fajitas, I marinaded a flat iron steak and some pepper & onion our favorite fajita marinade. We like it with chicken or beef. After a few hours in the marinade, I put the steak on the Big Green Egg, which was set up for direct heat at 600 f. Yeah, it was running rather hot! I shut the lid and left it alone for 4 minutes. Then I flipped it and let it go for another 4 minutes. I pulled it off of the Egg at that point. The steak was at an internal temp of 130f before letting it rest. I sauteed the veggies for a few minutes, shredded some colby jack cheese that I had smoked, and tossed it all on some flour tortillas. Not bad for a quickie.